WARWICK – The R.I. Public Utilities Commission on Tuesday rejected as too expensive a proposed power-purchase agreement between Deepwater Wind LLC and National Grid Plc, dealing a heavy blow to Deepwater’s plan to build a wind farm off Block Island. The three commissioners unanimously voted down the 20-year contract despite strong support for it from Gov. Donald L. Carcieri. They said the deal’s projected cost of electricity did not qualify as "commercially reasonable" under a test required by state law. The starting price of 24.4 cents/kWh is more than twice the price of power in the Bluewater Wind power purchase agreement. Why such a sharp difference? If, on the other hand, the objective is to facilitate a small-scale off-shore wind demonstration project for Rhode Island, and also establish a transmission link to Block Island, there may be a rational basis for the Commission to approve the agreement. On a larger scale basis, we would expect the unit price to be lower, but Deepwater was not able to achieve sufficient economies of scale to bring the price down further, despite increasing the number of turbines to eight. The problem isn't so much with the technology as with the structure of the deal. The demonstration project was intended as the first step towards a much larger utility scale project in federally controlled waters. I would guess that the location in state waters was less advantageous than the site in federal waters. I have said it all along: I'm in favor of wind power, but not at any price. The Rhode Island proposal was poorly structured and did not deserve to be approved. It was billed as a demonstration project, but what it chiefly demonstrated is that scale and location matter. "I wanted so badly to help the state get this initiative off the ground," said [PUC commissioner Paul] Roberti. Still, he and fellow commissioner Mary Bray offered support for the larger utility-scale Deepwater project proposed for 17 miles off the coast of Rhode Island. Those who closely followed the debate on wind power in Delaware will recognize the idea of starting with a demonstration project. Two years ago the Senate Energy and Transit Committee issued a report that urged that the Bluewater Wind proposal be scrapped in favor of the creation of "a task force to investigate the feasibility of a demonstration project for an offshore wind facility financially supported by the federal government and the states of Delaware, Maryland, New Jersey, and Virginia." This was an idea that Charlie Copeland was pushing two years ago. What would such a demonstration project demonstrate? The engineering is fairly well known, having been tested in Europe for years. As for the economics, we have learned that small scale offshore wind makes no sense. It takes utility scale projects of hundreds of megawatts to make offshore wind competitive. Will the GOP block financial reform to extract revenge for healthcare? John McCain, grumpy on a good day, was outright cranky over the passage of healthcare reform, promising "no co-operation for the rest of the year" on any legislation. After the near-death experience of healthcare reform, one might think that Democrats in Congress would be wary of taking on another large, complex bill that expands government involvement in the private sector. But instead of making things harder, Dodd said that the recent passage of healthcare reform "strengthened our hand" on financial reform. One Republican senator, Bob Corker of Tennessee, who has been talking with Dodd, thinks his party made a "major strategic error" by walking away from bipartisan negotiations on healthcare, giving Democrats a political advantage. Making things even more complicated for Republicans, another of their senators, Richard Shelby, has engaged in separate talks with Dodd. With the bankers being blamed for the current recession, it seems likely that several other Republican senators will be looking for ways to support financial reform rather than just dig in their heels. Correction: Senator Corker's office has pointed out that his comment about a "strategic error" was in relation to the financial reform bill, not healthcare reform. But it's hard to imagine the GOP stoking Tea Party populism by blocking regulation without being seen as siding with the banks. I don't think we will see angry voters shouting "Keep your hands off my hedge funds!" at town hall meetings this summer. Just saying no will not work for the Republicans on financial reform. For the first time, China led the United States and other G-20 members in 2009 clean energy investments and finance, according to data released today by The Pew Charitable Trusts. Last year, China invested $34.6 billion in the clean energy economy – nearly double the United States’ total of $18.6 billion. Over the last five years, the United States also trailed five G-20 members (Turkey, Brazil, China, the United Kingdom, and Italy) in the rate of clean energy investment growth. The 44 page report is available as a PDF here. In any complex scientific picture of the world there will be gaps, misperceptions and mistakes. Whether your impression is dominated by the whole or the holes will depend on your attitude to the project at hand. You might say that some see a jigsaw where others see a house of cards. Jigsaw types have in mind an overall picture and are open to bits being taken out, moved around or abandoned should they not fit. Those who see houses of cards think that if any piece is removed, the whole lot falls down. When it comes to climate, academic scientists are jigsaw types, dissenters from their view house-of-cards-ists. The doubters tend to focus on specific bits of empirical evidence, not on the whole picture. This is worthwhile—facts do need to be well grounded—but it can make the doubts seem more fundamental than they are. People often assume that data are simple, graspable and trustworthy, whereas theory is complex, recondite and slippery, and so give the former priority. In the case of climate change, as in much of science, the reverse is at least as fair a picture. Data are vexatious; theory is quite straightforward. Constructing a set of data that tells you about the temperature of the Earth over time is much harder than putting together the basic theoretical story of how the temperature should be changing, given what else is known about the universe in general. The fact that the uncertainties allow you to construct a relatively benign future does not allow you to ignore futures in which climate change is large, and in some of which it is very dangerous indeed. The doubters are right that uncertainties are rife in climate science. They are wrong when they present that as a reason for inaction. The editorial, which describes Biden's comment as "a little too pithy," does not call on him to break down his comment into its component parts. I don't think the schoolmarms are impressed. Now that health care reform has passed, Congress turns to financial reform and climate change: two more big complicated bills with lots of moving parts that would affect large portions of the economy. What could possibly go wrong? The good news is that these big complicated bills have a better shot at real bipartisan cooperation, with a handful of Republican senators engaged (if unenthusiastically) in crafting legislation. Senator Chris Dodd (D-Conn.) introduced his finance reform proposal last week without any GOP colleagues signing on to the bill. Dodd, who had been working on a plan with Senator Bob Corker (R-Tenn.), said he hadn't given up on a bipartisan approach, but wanted to get a proposal on the table. The Washington Post reports that Dodd went public to smoke out GOP objections. House Republicans are already ahead of him. Think Progress reports that House Minority Leader John Boehner (R-Ohio) told a group of bankers, "Don’t let those little punk staffers take advantage of you and stand up for yourselves." Republicans hoping to ride the wave of tea party populism to block financial system reform will find that populism breaks two ways. Yes, the bailouts were unpopular, but standing up for bankers may not arouse the popular uproar Boehner and his colleagues expect. Under pressure to quickly produce a bill, Sens. John Kerry (D-Mass. ), Lindsey Graham (R-S.C.) and Joe Lieberman (I-Conn.) yesterday shared an eight-page outline of their draft plan in a closed-door meeting with major industry groups. According to several sources in the meeting room, the bill will call for greenhouse gas curbs across multiple economic sectors, with a target of reducing emissions 17 percent below 2005 levels by 2020 and 80 percent by 2050. Power plant emissions would be regulated in 2012, with other major industrial sources phased in starting in 2016. No written summary has been circulated on the Kerry-Graham-Lieberman proposal. Stay tuned. WVUD, "the voice of the University of Delaware," is in the middle of its radiothon. The station has set an ambitious fund raising goal in order to boost its power from 1,000 watts to 6,800 watts. I am offering a challenge grant during Mark Taylor's edition of the Roots program. I will match ten $25 pledges with another $10 each. A pledge of $60 gets you a dream hour; you get to go to the studio and program an hour of music. It's a lot of fun. Mark offers a remarkably eclectic range of folk music: British and Nordic folk rock, blues, Texas songwriters, African guitarists and cross cultural collaborations. WVUD deejays are not bound by a play list, a freedom Mark makes the most of. He isn't afraid to play entire records like Punch Brothers with Chris Thile (who is playing a new mandolin concerto with the Delaware Symphony Orchestra this weekend), The Hazards of Love by the Decemberists, or San Patricio, the terrific new collaboration by Ry Cooder and the Chieftains, which he spun last week. 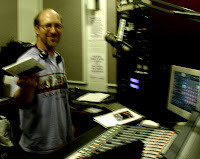 You can support WVUD by pledging online or by calling 302 831 2701. Or you could go to the special concert Friday night with the Walkmen, who look and sound like they are going to become really big really soon. Tell 'em TommyWonk sent you. A group of 29 governors, including Delaware Gov. Jack Markell, is calling on Congress to extend renewable energy incentives and require every U.S. electric utility to buy one-10th of its energy from renewable sources by 2012. Building new interstate transmission lines and infrastructure to bring renewable energy from large centralized facilities sited in remote but sunny deserts or the windy plains states to US population centers in the Midwest and East Coast. Increasing explicit support for coastal, deep water, and offshore wind technology and transmission research and development at the Department of Energy, as well as streamlining the permitting process for locating wind farms. Extending the Treasury Department's financing program that offers cash up front instead of the Investment Tax Credit, as well as a renewable energy production tax credit. Last week, Tom Carper joined up with Susan Collins and Olympia Snowe of Maine and Sherrod Brown of Ohio to introduce a bill to extend the production and investment tax credits for offshore wind. Why would a senator from Ohio be interested in offshore wind? Look at a map. The entire northern edge of Ohio looks out on Lake Erie. Absurdly, the current tax credit expires in 2012. It is difficult for developers to take advantage of the credit when their lead time is longer than the life of the credit itself. Putting a price on carbon (one of the objectives of climate change legislation) is intended to capture externalities so that polluters pay for the harm caused by their emissions. One way to put a price on carbon is to require companies to disclose risks related to climate change. As investors weigh the risks, companies that emit carbon will find their cost of capital is being adjusted to account for the risks of pouring carbon into the atmosphere. New guidance from the Securities and Exchange Commission was intended to clarify how companies should explain the effects of climate change on their businesses, but last month's 29-page interpretive release may raise more questions than it answers. Investor groups have long been critical of companies' lack of candor regarding climate-change risk, and of the SEC for allowing them to get away with it. For instance, property insurance companies face the risk that beach front property will face higher flooding risks. Coal companies face significant risk that the cost of their products will be affected by new laws or regulations. In the last few years, utilities and energy companies have found it harder to finance coal plants as investors look at higher costs down the road. 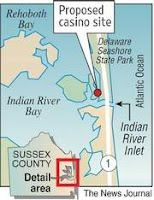 The plan by Clinton Bunting -- son of state Sen. George Bunting, D-Bethany Beach, who represents the area and is opposed to expanding gambling in the state -- would turn an area on the bay side of Delaware Seashore State Park near the Indian River Inlet Bridge into a casino, hotel, restaurant, retail and conference center. State representative Greg Lavelle dryly observed, "It would certainly be an unorthodox use of a state park." Unorthodox is a polite way to put it. Public land should be reserved for public purposes. Those private businesses that do operate in state or national parks generally support the public use of those parks by providing essential services to visitors. Delaware's Seashore State Park drew 1.1 million visitors, who presumably found the vista of dunes and waves refreshing enough without the extra attraction of video lottery machines indoors. Jack Markell yesterday presented a new proposal to boost and extend the renewable portfolio standard and promote the development of green energy jobs in Delaware. 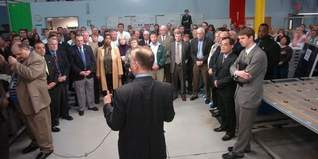 Markell went to the Motech Americas solar panel plant in Newark to announce the Delaware Clean Energy Jobs Act. The proposal would extend and expand the renewable portfolio standard (RPS) to 30 percent by 2029 and for the first time include the Delaware Electric Coop and the municipal energy providers. The RPS would include requirements for solar and locally generated energy. Markell estimates that the RPS would prompt the development of 300 megawatts (MW) of solar power in Delaware. The year 2029 seems a long way off, but the extended RPS will make it easier to finance solar projects today. The renewable energy credit (REC) market in Delaware is small and thinly traded. DNREC secretary Collin O'Mara pointed out that solar power projects in the works in Dover (10 MW) and the University of Delaware (6 MW) will swamp the REC market for the foreseeable future, making it difficult to finance further projects. As Aaron Nathans reports in the News Journal, Motech bought the GE solar power plant, and its inventory of solar panels last winter after it had been announced that the plant would close for good. Motech managers said they plan to ramp up hiring this year. More on the announcement can be found at the governor's website, including a one page fact sheet. The legislation will likely be introduced later this month. If, as we are used to hearing, wind power is so expensive, then we should be seeing electricity prices climb as more wind power projects come online. One of the most common arguments for not addressing climate change and reducing greenhouse gas pollution is that the solutions are cost-prohibitive. However, amidst Iowa’s massive expansion of windpower, our average electricity prices have remained below the national average and in fact have not increased as quickly as the national average price in the last four years (2005 to 2008). The data from the Energy Information Administration show Delaware's electricity prices climbing even faster that the U.S. average. Delaware could use some of the price stability that wind power seems to be providing Iowa. Meanwhile, states who are still having trouble getting their act into gear might take a gander at how Delaware did it. As I noted on Friday, Delaware got the money on the street by using its existing social service centers and working with non-profits, businesses and labor unions. Nordhaus and other modelers, making their best possible estimates, come to the conclusion that while emissions must eventually be brought way down and carbon concentration stabilized, it’s not worth doing this until K has risen a long way above current levels. So it’s a mega-St. Augustine: O Lord, make us carbon-neutral, but not yet. Lately, climate models have begun suggesting a lot more sensitivity to concentration, with a number of groups doubling their predicted temperature rise. 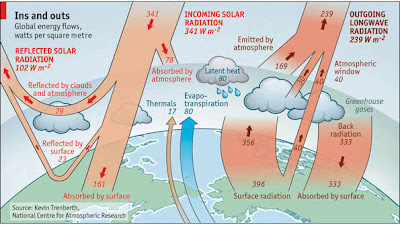 As for the welfare sensitivity: Marty Weitzman has managed to scare me, by pointing out that there’s a pretty plausible case that a rise of 5 degrees C – which is no longer an outlandish prediction – would be utterly catastrophic. You don’t have to be sure about this; just a significant probability is enough. In economics, a significant probability of a catastrophic event creates a cost, even if the catastrophe doesn't occur. One either has to set aside reserves or buy some kind of insurance to protect against the potential damage or face catastrophic losses. The Inspector General of the U.S. Department of Energy has released a report lamenting the slow pace of deployment of funds for weatherization. The American Recovery and Reinvestment Act (ARRA) allocated $4.73 billion for weathering homes over a three year period. Of that, only $368.2 million (less than 8 percent) has actually been used. The good news is that Delaware leads the country in spending the money. Matt Denn, who oversees Delaware's use of stimulus money, announced yesterday that Delaware has met 34 percent of its three year target, which means the state is right on schedule. It is really a classic Delaware story. When we realized in the fall that the program was not starting as quickly as we had hoped, we gathered the players together, decided on a plan to ramp up our efforts, and implemented that plan. The funds were not distributed through the Delaware Energy Office or the Sustainable Energy Utility, but through the system of state service centers run by the Department of Health and Social Services. These centers already serve the target households on a daily basis, and thus could easily identify and work with the families that need the work. In preparation for tonight's talk on climate change at the UUFN, I have been thinking about the economics of energy. When I was just a kid, I remember standing on a corner of Rodney Square passing out fliers in support of the Coastal Zone Act. A man came up to me and asked what we would all do for a living if the CZA were passed. I didn't have an answer for him, but I have been pondering the question of environmental economics ever since. A budget analyst I once worked with had a slogan pinned to his bulletin board: "If you don't know the numbers, you don't know the business." I am convinced that the only way to make progress on renewable energy is to know the numbers. We learned this during the fight over Bluewater Wind. Opponents of offshore wind tossed around all sorts of spurious numbers of what it would cost. We needed to be able to refute those bogus numbers and offer compelling reasons why it made economic sense to lock in a supply of electricity at a set rate for 25 years. We won the fight because we won the argument over the economics. Decisions about energy are asset allocation decisions, which is what I was taught in business school. As proponents of renewable energy, we need to master, or at least understand how to approach these decisions. By pointing out the economic benefits of renewable energy and energy conservation, we make it less scary. Environmentalism should not be about personal virtue or deprivation. I’m not interested in telling anyone they have to live in caves or tepees to protect the planet. As I noted yesterday, Dr. Chad Tolman had this op-ed published in Saturday's News Journal. Dr. Tolman and I will speak tomorrow night at the Green Matters program at the United Universalist Fellowship of Newark. In Delaware's amicus curiae in support of Massachusetts, filed in August 2006 in the Supreme Court case of Massachusetts v. the Environmental Protection Agency, then Attorney General Carl Danberg wrote, "The State of Delaware is greatly concerned about the impact of global warming on its citizens. As a low-lying coastal state, Delaware experiences daily the effects of global warming. These effects include increased flooding and coastal erosion, increased ocean temperature, and heightened damage to the environment, the property and the people of Delaware." Now Sen. Lisa Murkowski, R-Alaska, is trying to overturn the endangerment finding and strip the EPA of its authority to regulate GHG emissions, to the detriment of Delaware and other low-lying coastal states. Because of our low average elevation (60 feet, the lowest of any state) Delaware is especially vulnerable to sea-level rise, one of the consequences of global warming caused by burning fossil fuels. Since we don't have the oil and gas that Alaska does, we have more to lose from unbridled GHG emissions -- including our beautiful beaches, marshes and buildings along the coast. Fortunately, Delaware's Sen. Tom Carper has taken the lead in opposing Murkowski's move, supported by Sen. Ted Kaufman. In a press release on Jan. 21, 2010, Sen. Carper wrote: "I strongly oppose Sen. Murkowski's resolution to overturn the EPA endangerment finding because the science about global warming is clear: Greenhouse gases endanger public health." Now is a good time to call both senators and thank them for their role in protecting our interests. We should also call Rep. Mike Castle to thank him for voting in June for H.R. 2454 to begin to reduce GHG emissions and support the transition to a sustainable energy future and the new industries and jobs it will bring to our economy. The forces of denial and resistance to change are strong. Take a few minutes to call your members of Congress and let them know they are appreciated. If you don't live in Delaware, contact your senators and ask them to support Sen. Carper. Chad Tolman is energy chair for the Delaware Chapter of the Sierra Club. Dr. Chad Tolman and I will be on the program at the United Universalist Fellowship of Newark this Wednesday night at 7:00 p.m. to talk about climate change. Chad knows as much about climate science as anyone in Delaware. I will talk about the economics. The News Journal published Chad's op-ed on Tom Carper, Ted Kaufman and the EPA's endangerment finding on carbon emissions. Carper and Kaufman. As I reported back in January, all twelve Democratic members of the Senate Environment & Public Works Committee, including Carper, signed a letter opposing an attempt to overturn the EPA's ruling.